Heritage Envelopes provided the setting for the Chamber’s latest ‘Making it in Lancashire’ Manufacturers’ network. Over 50 local manufacturing businesses attended to hear from Jake Berry MP and Minister for the Northern Powerhouse and Local Growth. 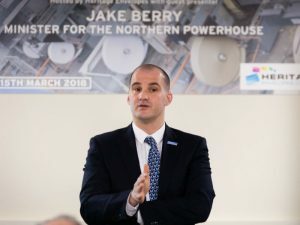 As MP for Darwen and Rossendale Jake Berry was passionate about the need for Lancashire to be a key player in the Northern Powerhouse but he warned that the absence of a metro mayor would hamper our representation. A quick straw poll indicated that this was a popular choice among the delegates. Jake was also highly complimentary of the hard work and cutting-edge skills that Lancashire’s manufacturing sector bring to the economy. Other topics discussed included HS2 rail and the need for a further trans Pennine road link to ease the burden on the regions roads. After a busy question and answer session delegates were also given a tour of the Heritage Envelopes site by MD Mark Sears. Making it in Lancashire is a regular series of meetings with keynote speakers and best practice site visits. Recent events have been held at BAE Systems and Whatmore. This year’s events are sponsored by MHA Moore and Smalley. Details of our next meeting will be announced soon.